ExpressURWay brings you several stunning collections of women's suits to choose from featuring elegant church suits and women's skirt suits. Whether you have a family member's wedding to attend, an important business meeting to lead, or simply want to look your best for next Sunday's service, ExpressURWay has the perfect looks that will suit you on the weekend and throughout the work week. Women's skirt suits - Discover a rainbow of women's skirted suits and three piece sets including blouses, jackets and feminine skirts that work together to create a look that is chic, fresh and completely pulled together! Ideal for special events, mix and match your skirts and jackets with different tops and bottoms for endless possibilities, then accessorize with a purse and hat combo in the same stunning shade as your new favorite suit! Designer women's suits - This spring you will see every top womens suit designer at their best. From Ben Marc to Misty Lane and the stylish Stacey Adams, you will find younger looks while still capturing their elegance from seasons past. Wow the crowd with the Stacey Adams dress/suit collection, the very classy DVC line will be sure to catch your eye, and Chancelle and Tango have gone above and beyond style with something for every occasion. Plus size women's suits - Express yourself the right way with the perfect-sized suits that hug all of your curves in the most flattering ways! Fill your wardrobe with lovely ladies suits that will help you look your absolute best no matter what the big event is planned in a size that is just right for you. Choose from plus size women's skirt suits that are available in sizes up to size 36W, so you'll always feel comfortable while looking dressed to kill! 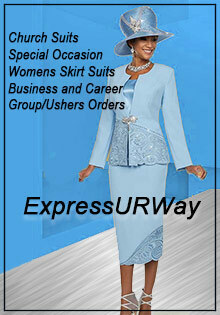 Church suits - Prepare for worship when you step into Sunday services wearing glorious church suits from ExpressURWay! Donna Vinci is back for the spring with stunning suit styles and hats to match, as well as Champagne, Ben Marc and more of the leading women's suit designers! Choose from two-piece dress suits or three piece women's skirt suits that you'll look forward to wearing to church every single week. Plus, find the perfect suit to walk down the aisle in when you're the Mother of the Bride! Devine Denim suits - Enjoy a look that is casually elegant with the Devine Denim Collection of women's suits that feature the comfort and trendiness of stretch denim in a beautifully tailored and structured suit! Devine Denim stretch denim suits are available in pant sets or women's skirt suit sets, and come in a wide range of colors including white, black, red, Springtime pastels and of course, denim blue! Women's work suits - We've all heard the phrase "Dress for the job you want, not the job you have." When you slip into businesswomen's skirt suits and pants suits from ExpressURWay, you'll have the style and confidence you need to ace every interview and nail every promotion! Find a sleek selection of women's career suits from Ben Marc Executive including gorgeous suits, sets and separates that always leave a lasting impression! Find something for every occasion that will help you look stunning this Spring including Mother of the Bride suits, first Sunday, pastor's anniversary women's suits or something for that special night out. Whether you are a size 4 or a size 36 you will find something that will look perfect on you. Available in every style, color and size imaginable from fresh pastels to plus size women's suits that fit like a glove, feminine women's skirt suits to church suits to power suits that show who's in charge at the office, you'll love suiting up with the women's suits from ExpressURWay.